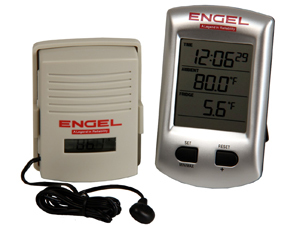 Wirelessly monitor your fridge, freezer or cooler temperature from up to 100 yards away. Place the receiver on your dashboard or in your galley and easily keep track and monitor your fridge, freezer or coolers performance. Each unit is coded and once paired will not interfere with other units operating in the same area. So you can set up multiple units if you wish. Easily switches from �C to �F. Battery life: Approximately 24 months for receiver. Approximately 24 months for transmitter. Thermo Sensor: Wired remote thermo sensor attached to sender unit. - so the sender and batteries can stay out of the fridge. Includes two hook and loop fasteners with adhesive backing. Receive displays temperature in degrees F and C. Sender displays temperature in degrees C only.